The Bicycle Film Festival hits Minneapolis July 8-12, with cycling related films and events at different locations during the week. There are several films with local connections. DOWN BY THE WEEP HOLE: THE STORY OF THE STUPOR BOWL is "the story of Minneapolis' Stupor Bowl, the world's coldest and most inebriated alley cat race. The movie chronicles the race's development from a twenty-person local event in 1997, through 2009 when over four-hundred national and international competitors made the harrowing journey through the Twin Cities' frozen streets." Film maker and friend Mike Hazard has a short taken from his documentary MR. POSITIVE, called SOMETHING BRIGHT TO BE SEEN IN OUR WORLD. Carl Bentsen is a light in the neighborhood, in more ways than one. More Midtown Greenway mischief last week. Kids tossing rocks off one of the overpasses struck three riders (only the two without helmets were injured). But things are dangerous for cyclists all over, including near downtown Wayzata, where a rider was struck by a four-time loser drunk driver. He was hit in a crosswalk when the driver backed over him. That location is a dangerous spot even without drunks, where streets, train tracks and a bike path coverge where almost everyone is making a turn. Dark blue on the left is the bike path; light blue is a downhill stretch of the popular Ferndale Road loop into town, where most bike and vehicular traffic is turning right. More bike trail news, the Luce Line extension through Golden Valley to Wirth Parkway has been completed. A nice paved trail winds through the south end of Wirth Park and comes out near the Par 3 golf course. I'm waiting for the first injury report of a biker hit by a duck hook. Not exactly bike news, but "False Witness! The Michele Bachmann Story" is in stock at Big Brain Comics, 11th and Washington Avenue S. They have plenty of bike parking. I've been on a reduced blogging schedule, obviously, and haven't yet broken out in hives. Hard to say whether it will become a reformed habit. Meanwhile, here's a cross-post from the Growth & Justice blog. Tony Wikrent of Nation Builder Books spoke at Drinking Liberally in Minneapolis last week, and The Cucking Stool produced this video from the conversation that ensued. His comments — on the respective roles of the free market, financial and industrial sectors and the political system — provide a critique of what happens when national goals are determined by theoretical economics and the free market, without enlightened guidance from the political system. For example, he says, allowing the free market to set industrial policy — say, reducing national petroleum consumption — doesn't necessarily result in the best asset allocation to benefit society. The question, he says, is how do you re-regulate a financial system so that doing the important, productive work that needs to be done is what's profitable? Next, a video featuring Chris Ware's character, Quimby the Mouse, via Mark Gisleson. Quimby was a strange, early and often impenetrable Ware creation. Is this about mouse-cat-fish relations or love and co-dependence? You decide. 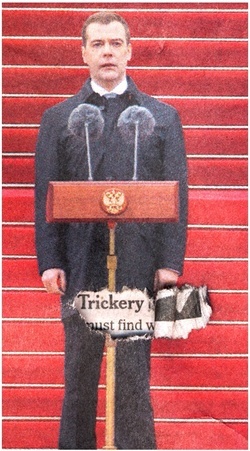 Vladimir Putin's successor (does it matter what his name is?) 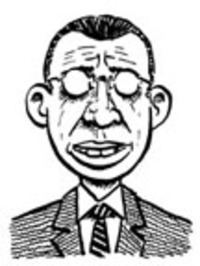 takes office and designer Chip Kidd's newspaper arrives with a custom illustration. At dinner last night a long-lost friend asked what we were reading. My domestic partner had a really good, well-rounded answer: The Omnivore's Dilemma, The End of Poverty and Death's Jest Book. I knew he meant on paper. I'm reading a zine, I said. For Bill Brown's sake, I should've given a better explanation than I did. So my first theory is that you can tell what a society really values by the stuff that it keeps cheap. It's the stuff that's important enough that anyone can afford it. Cappuccinos in Italy, for instance, or vodka in Russia, or double cheeseburgers in the U.S. Cheap stuff is what a society doesn't consider luxuries but staples. Baguettes in Paris. Pizza slices in Naples. Bagels in Montreal. The inverse of my theory alsop applies: if you can't affort the price of a cup of coffee in a Parisian cafe, for instance, then maybe cafe culture is not as important to the Parisians as people claim it is. Sergio is silent. "But everything in Paris is overpriced," he finally says. My second theory — okay, it's actually an observation — has to do with the Metro. I ask Sergio if he's ever noticed the litttle warning signs stuck to the doors of the Paris subway. The signs warn in different languages not to lean against the door. I've noticed that the Italian version is always followed by an exclamation point. The French and German versions aren't. Neither is the English version. I wonder if this is some kind of cultural stereotyping, as if the only way to get an Italian to pay attetnion is to yell at them, or make a crazy hand gesture. The indicative is okay for everyone else, but the imperative is reserved for Italians. I ask Sergio if he thinks this is offensive. He shrugs. Sometimes You Make a Difference. I've taken a break from reading stuff about taxes, economic development and who's tried on tribal costumes, but even my fun reading draws me back to politics. 'Zines may seem to be the polar opposite of white papers on education and transportation policy, but they can also offer a potent reminder of why any of this politics stuff matters. A few days ago, I read Call for Reservations, an account of working as a housekeeper at a Super 8 Motel in Stillwater, Minnesota, that was used in part by the county for transitional housing. Elizabeth Belz is an artist who has lived Nickled and Dimed for real, and she exposes aspects of motel life you'd probably rather not know. Now, I'm halfway through On Subbing, an expanded collection of Dave Roche's 'zines documenting four years as a Substitute Special Needs Educational Assistant. Roche was a punk rocker who, as one reviewer put it, spent a brief time in the "thrift store clerk industry" before signing on as a classroom aide in the Portland, Oregon, schools. He worked as a sub, which meant he had brief assignments in a wide variety of schools. What makes his stories so compelling is that he worked with the kids who are on the absolute fringes of the system — the behavior problem kids, kids with retardation or severe physical disabilities, homeless kids, very few of whom would fit the definition of students. It's a harrowing and heartbreaking picture, as Roche describes the barriers some of his charges face. Two boys are abandoned by their mother in a homeless shelter. When some of his medically fragile kids go home, it's to a hospital. Changing a diaper or keeping a boy calm might be all he gets accomplished in a day. Mostly, he retains his empathy and his humor. After one frustrating day he reminds himself, "I'm getting paid to play with Duplos." Though not paid very much. He's inspired by a one-on-one assignment with an "awesome and super cheerful" boy who's paralyzed from the neck down, and considers the school's offer to take the open position to be his regular aide. But it's only for half days, and though he tries to work it out, the school can't give him hours for the rest of the day. He leaves feeling guilty, but heeding the holes in his shoes and his empty stomach. He can't live on the part-time work. Unlike the kind of poignant Hallmark snapshots political candidates haul out for Message: We Care, 'zines like Belz's and Roche's preserve raw emotions and offer gritty realities. It's easy enough for progressives to stand for some sort of idealized social services without appreciating how damned difficult the work is and how little apparent effect some of it might have. For conservatives who see social services as a waste of money, I'd ask them to read Roche and then ask for their solutions. It's difficult to see how vouchers and privatizing education would lead to any better outcomes for these kids. A commenter on the publisher's site put it pretty well. There are no To Sir With Love/Dangerous Minds moments when he realizes that he can truly make a difference in the lives of these needy children. Sometimes Dave makes a difference. Sometimes he gets kicked in the balls. I found both these books in the Studio Shop at Minnesota Center for Book Arts. Big Brain comics, right down the street, is a superb source for more of this subversive but also affirming work. 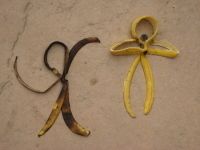 A Purge of Banana Republic. Kirk said he was told his dismissal was "the 'standard reassessing our priorities' reason; that they needed money for another part-time editorial writer to replace the ones that they cut." Since Generalissimo Avista took over, the Strib's editorial writing staff has been gutted; people like Jim Boyd, Steve Berg and Kate Stanley have not been replaced; another vet, Dave Hage, will leave soon. By my math, Kirk's freelance pay won't even cover half a full-timer, but interim-and-possibly-longer editorial page editor Scott Gillespie has to be in triage mode right now, and several editorials a week no doubt look more alluring than a single quarter-page cartoon. By my math, the equation is wrong. The loss of that gang of four, plus editorial chief Susan Albright, had to save the Strib a lot more than that, even with a couple buyouts thrown in. If you're replacing all those departures with a part-timer, does that really mean you have to cut loose a freelancer, too? 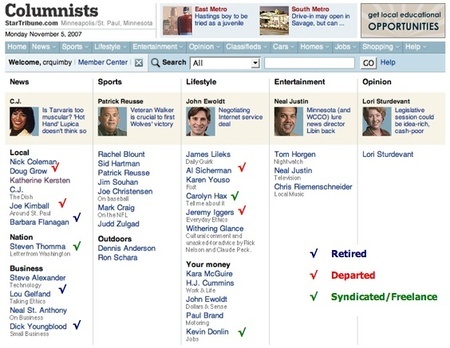 Here's the Strib's line-up of columnists. It's extremely slanted toward sports, entertainment and lifestyle. Four of the names on the page are already gone — presumably still there because some columns remain in the archives. The roster also includes three retirees who manage a column once a moon and three non-staffers. Thomma's column doesn't appear to be archived, and Donlin writes a jobs column so the Marketing Department has content for the Classifieds. Consider that C.J. and Katherine Kersten are included under news, and the depressing picture really emerges. The right put up a huge stink when James Lileks' increasingly irrelevant humor columnette was axed earlier in the year, and he went on to his reward. Anderson supporters are more likely to shrug and say, what did you expect? Want to look cute for the car pool? These comfortable and chic outfits take little effort on manic mornings. Now there's one less reason to buy the print edition. Joe Sacco: War Reporting Without Spokespeople. I would've preferred to be in the seats at Walker Art Center tonight instead of repairing two thorned bike tires a thousand miles away. But as I worked, I did catch comics journalist Joe Sacco's interview on MPR. He also sat for this one. And video of his artist talk at the Walker should be archived here before long. Sacco goes to war and brings back stories. Not, as he says in the interview with Euan Kerr, as an objective journalist who gathers facts and then washes them out with statements from opposing spokespeople who say something else entirely. He's a subjective journalist reporting honestly about what he sees and thinks. Seeing something and rendering it visually instead of in words is laborious for the reporter, but it can illuminate a subject in a personal and accessible way. He can't tell us what happened in abstractions and generalities. He must tell the story through people. Palestine, a Palestinian view of the Israeli occupation. The Fixer. Sacco returns to Bosnia 10 years later to find the man who helped him find his stories. Notes from a Deafeatist, early work which includes "When Good Bombs Happen to Bad People," a history of aerial bombing targeting civilians; "More Women, More Children, More Quickly," about his mother's experiences during World War II in Malta; and "How I Loved the War," Sacco's reflections on being a spectator and commentator on the Gulf War. Fallout. Ottaviani and other artists tell the story of "J. Robert Oppenheimer, Leo Szilard, and the "Political Science of the Atomic Bomb." Berlin: City of Stones, Book One. Book Two is still being written, serialized in the comic Berlin. Auschwitz by Croci is not the definitive holocaust graphic novel that Spiegelman's Maus is, but how can only one masterpiece encompass the atrocity? Persepolis. There's a P1 and P2, about a girl's coming of age in Iran as the mullahs come to power. This and Sacco's books will probably give you a more memorable feel for what went on in these regions than most "serious" works. This semi-annual zine produced by multiple artists. Many back issues, plus the books above can usually be found at Minneapolis's Big Brain Comics.